Here at the Seed Creative Academy, one of our main focuses is to provide unique and authentic opportunities for students to showcase their work, and to experience the creative industries in real-time. Students on our BA (Hons) Professional Studies in Creative Industries course recently had the chance to exhibit their coursework on Leicester’s Highcross Beacons. 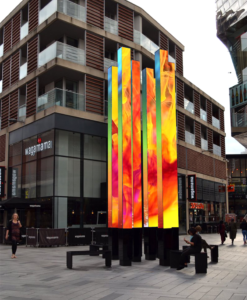 This interactive digital light sculpture, located in the centre of St Peter’s Square, is seen by hundreds of passers-by every day and is a highlight of Leicester’s City Centre. The brief was to create an immersive piece of visual art to reflect Leicester’s multiculturalism, diversity and creativity, as part of the #LoveLeicester campaign. The works put together by the students are a mixture of motion graphics and animation, crafted into unique and compelling pieces to express the students’ visual identity, as well as their approach to design. One of the works shown on the Beacons was ‘Pixel Dancers’: the students (Kate Folwell, Lois Hunt, Salman Mussa and Daniel Skinder) created it by filming their dance moves in front of a green screen at De Montfort University. They were then able to digitally track their movements and convert them into pixelated figures. Another of the students involved in the project, Dominic O’Connor, said, ‘I had a really good time working with my team (Connor Buckley and Charlotte Stanyon) alongside Seed. I really enjoyed being able to bounce ideas off one another and combine our specialisms. We were all really proud of the vibrant digital art that we created, going through the process together, exploring ideas and experimenting with techniques to see the final piece on Beacons was amazing.’ You can check out their work on Dominic’s website. We believe that allowing students to build a meaningful portfolio, while gaining practical experience, is fundamental in developing the next generation of creative talent. Here at Seed, we’re immensely proud of the enthusiasm and dedication shown by students during the project, as well as the sheer talent and skill shown in their work. 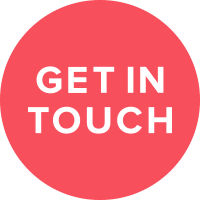 If you would like to be a part of our creative family, through one of our short courses or a full-time qualification, get in touch.